This project will replace two existing culverts with a box culvert through the head waters to California Creek. 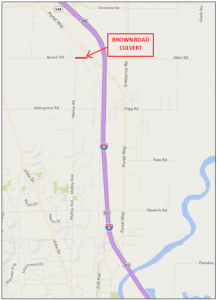 The project will also restore approximately 150 linear feet of roadway at the crossing of the culvert on Brown Road, just west of BNSF Rail Road crossing. The project is located between Portal Way and Malloy Road in Ferndale. 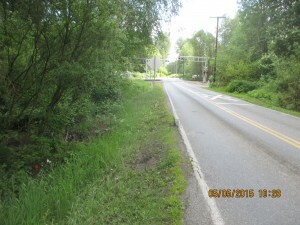 The Ferndale City Council awarded the project construction contract for the Brown Road Culvert Replacement project to Trimaxx Construction, Inc. of Sedro Woolley, WA for the bid price of $286,570.00, on June 1, 2015. Construction is anticipated to begin July 20th and will likely be completed by the end of August 2015, weather dependent. Brown Road will be closed to all traffic during construction. During construction, traffic will be detoured. 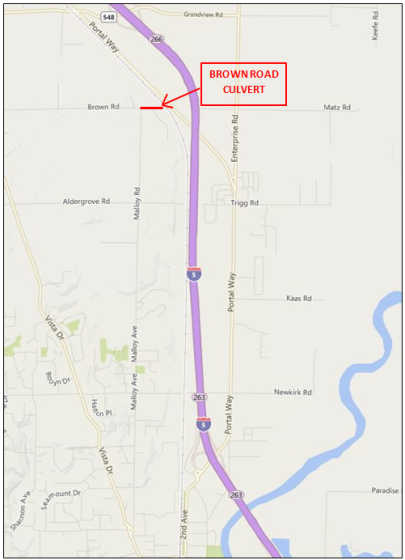 The project will consist of removing a section of the roadway and replacing the aging culverts just west of the BNSF railroad crossing near Portal Way. A new box culvert, designed to allow fish passage, will be installed and the roadway will be reconstructed. The City of Ferndale Public Works Department is always happy to answer questions about our ongoing improvement projects. Please feel free to contact us at (360) 384-4006. Updates will be available on our website and facebook page.